Natural stone comes in an endless variety of colors and choosing the right one can be a daunting task. Homeowners often want to match their new flooring and countertops to items they already own, or to their existing paint scheme. While this may sound like a logical approach, it's best to keep in mind that items can be always be moved, and paint is the quickest and least expensive way to completely change the look of a room. It's best, when choosing something as significant as flooring or countertops, to reconsider the entire space. Think of it not concerning what it currently is and how you can fit the new colors into it, but of what space could be. After investing thousands of dollars into natural stone countertops, it is a small thing to repaint the walls, change the handles on the cabinet doors, or replace a white microwave with a stainless steel one. Reinventing your space, instead of retrofitting it, may be intimidating at first, but when you take this approach, you will end up with a much more cohesive, professional look. Colors play a dramatic role in setting the mood of a room. As a general rule, cool colors (blues and greens) tend to make a room feel more spacious and formal, while warm colors (reds, yellows, and browns) lend a cozy feeling. Consider not only the color of the paint and stone, but the light which enters the room. If it is a north-facing room, it will tend to feel “cooler” simply because of the natural light, as will rooms which face east. South- and west-facing rooms will feel warmer. This light can be balanced by choosing colors on the opposite side of the spectrum. If your living area faces west and receives the yellow and red light of the last half of the day, but you desire a more sophisticated look, choosing paint and stone with green or blue tints will help bring it into balance. For most rooms, though, start by choosing the color of stone that you love. Don't worry about how it will fit into the room. You'll worry about fitting the room to the stone later. Choose a stone that you think is beautiful, regardless of whether it matches the color of your cabinets or walls. You will be far more satisfied, in the end, by choosing a stone that you simply adore, rather than choosing a color or style because you think it will match. Once you've chosen your stone, imagine what colors will look best on the walls. Choosing a color within the same color family will help the room blend into itself, and the resulting uniformity will give it a comfortable feel. This is called monochromatic color theory, and it tends to create an atmosphere of coziness and quiet elegance. Choosing colors adjacent to the stone's color on the color wheel is called analogous color theory, and is similar to monochromatic theory. It produces a subtle feeling, as long as one color (the walls, for example) is chosen as the dominant color, and the rest of the room (stone, floor, and accent pieces) are allowed to enrich the dominant color. Choosing a complementary color scheme (colors opposite each other on the color wheel) will give the room a sense of motion and contrast. It looks best when the dominant color (walls and floor) is cool, and the accents are warm. Cool accents in a warm room tend to look awkward. Because of the strong contrast produced by a complementary color choice, many designers choose to use the colors just adjacent to the complementary color, rather than the complimentary itself. This can help soften the effect. A triadic color scheme uses three colors spaced evenly apart on the color wheel. This scheme tends to make a room look harmonious, logical, and balanced. Because stone is a natural product, it will likely contain many colors in itself. This is especially true of slates and some granites. In these instances, it is quite permissible to draw the colors for the room from the palette of colors represented in the stone. Then, it is the stone that serves as the harmonizing factor in the room, and thus is becomes the focal point. Some general rules of thumb for choosing shades of color (the lightness or darkness of a particular color) is that darker shades make a room feel smaller, and lighter shades make it feel larger. Dramatic changes in color value in different parts of a room can make its shape feel different. A kitchen with dark marble on the floor, but lighter walls and a white ceiling, will make the ceiling feel higher than it is. Conversely, dark colored walls with light travertine on the floor will bring the perceived height of the ceiling down, making the room feel shorter and smaller. Keep in mind that, when trying to choose a color shade to match your stone, even the smallest sample of natural stone will contain a wide range of colors. So don't fret for hours between Harvest Pumpkin and Autumn Umber. Likewise, taking a sample piece of stone to a paint store isn't always the best idea. The marble tile you hold may have a much larger concentration of dark browns, while the tile in the box beneath it is almost entirely light. Color theory can be intimidating for many people. Luckily, there are dozens of books available which can guide you through the process. If in doubt, consult an interior decorator. But rest easy…the most dramatic thing you can do to a room is changing the paint on the walls, and if you hate your first choice, you can always repaint. It won't cost much beyond your investment of time. Your granites are gorgeous! I'm absolutely dazzled. I already went to your Ridgefield Park showroom twice. Would still like your input on design choices. I'm working on a 14x12 kitchen complete renovation. Have purchased very light birch cabinets with mirror like white appliances, stainless steel hood and cooktop. Looking for a granite countertop that compliments both warmth of the natural birch and sleekness of the appliances. I went to your Ridgefield Park show room twice and was attracted to black with golden veins, such as 633L, 619L or 904R, but none of them had samples available. ended up with a sample of 731L of which I'm not in favor of the black blotches. By the way, the kitchen has a window facing north west, and has a pennisular and opens up to the dining room with a patio door facing the same direction. What are your thoughts? Carol: I'm leaning towards the 619L in your choices, it's called Ubatuba. It has the sleek, modern style but will compliment and contrast the light wood. Another option might be Butterfly Antique. You're on the right track, good luck! LOVE your website! We live in NC, and are so sorry you don't service our state. We're getting ready to start a major remodel: 10x11 L-shaped with a 5x3 island w/natural bamboo butcher block. Cabinets will be a soft white (not stark white)shaker style; cork floors (light brown),and American Clay walls. We want to include warm colors, e.g., gold, brown, autumn orange, cream. Light is from the east thru 2 sliding glass doors and one tubular skylight...still has a tendency to be a little dark with lots of shade trees. Love granite with movement...considering mango bordeaux. Other recommendations??? Barb: Mango Bordeaux is a beautiful choice. I'd recommend to also consider some other options from the exquisite "Bordeaux" family of stones from Italy. Some good choices would be: Crema Bordeaux, Typhoon Bordeaux. Rich color with lots of movement that would fit your design nicely. Good luck! My Kitchen faces South west, and gets barely any light at all. My cabinets are cherry wood. The room T's off connecting the entry way and a den, all visible to one another. We're replacing the counter tops, backsplash, flooring and painting the walls. Appliances are cream color. We have dogs so we're opting to stay away from wood floors. I love your website because of all the help you offer in choosing color schemes, etc. I'm still not sure what color works best to give off a bright but sophisticated feeling against the dark cabinets. I know I don't want a dark colored floor.....the brighter the better. I'm terrible with color schemes and can't seem to get it all together. Have any suggestions to simplify this project? Thanks for your help! Dolores: I recommend to look at Santa Cecilia, New Venetian Gold, Giallo Napoleone, and Giallo Ornamental. They are warm and creamy colored stones with a consistent pattern that would offset the cherry wood and create the necessary contrast. In addition those stones have occasional wine colored flecks that compliment the cherry cabinets nicely. For flooring, try a light travertine tile. Margaret: I recommend Bianco Romano for a sleek and elegant design. It will compliment the light perimeter wood but offset the dark island. I love the crema bordeaux stone. We have picked cherry cabinets. I have a U-shaped kitchen area that is approximately 7'X8'. One wall is a half wall which has a breakfast bar and opens into an 8'X10' dining area. Wall color and backsplash color is the question. What do you recommend? The floor is pine so I plan to refinish it. Any particular color stain you would recommend? Terri: Try Benjamin Moore "Honeyed Almond" for wall color and a tumbled botticino marble tile for backsplash. I think the floors would look gorgeous stained in a warm honey color. What does "tumbled" mean? Is it one of the marbles in your website? If I use tiles, how much is it per sq foot? I am redoing a 12x10 kitchen. Cabinets are natural maple (very light). Natural oak floor. Stainless appliances. One window over the sink that faces west. East wall will be partially opened to LR with a tiered counter with backsplash. Wainscoating underneath. Love the green butterfly granite. Is that too dark for those cabinets and the size of the room? What would you recommend? Also what colors would you recommend for a tile blacksplash and wall color? Thanks so much! Mary: I think the Butterfly Green would look gorgeous and create an excellent contrast. Another option is Pocono Green. For backsplash try a tumbled noce travertine tile. Thanks for the color evaluation. We're remodeling. We will have a 2/3 perimeter counter. A central 6 x 8 foot triangular island. The sink window will face NW. The NE counter will face a great room. We'll have a 14" light-tube centered over the island. The new cabinets are hickory with a light oak stain. We have been looking at Verdi peacock as the island stone. Do we need a contrasting stone for the counters? We've thought about Venetian Gold light. Other choices? What color for the appliances? Cyndi doesn't like fingerprints on the stainless steel. Jeff: For the perimieter countertop, I suggest New Venetian Gold or Santa Cecilia. You can go with white appliances to add a stylish component with less fingerprints. I have Timberlake Maple spice cabiles, tan tile blacksplash with veins, stainless steel appliances and cherry hardwood floors. The kitchen is in the middle of the house facing east. What color granite should I choose? I was thinking about Giallo Fiorito, Giallo Ornamentale or Baltic Brown. Evelyn: I'm leaning towards Giallo Ornamental as it's a warm choice that will provide good contrast in your design. Susan: I recommend a tumbled mocha travertine tile. It has depth and warmth, but keep the tiles horizontal in design. We are replacing our kitchen countertop. We have a 16x18 kitchen, north-facing, with very small windows which let in little natural light. Our cabinets are dark cherry, with medium-dark cherry flooring. We have stainless appliances and an exposed red-brick fireplace in one corner. We really need light reflection, so we have been thinking of doing a white granite, but are afraid that it will make the kitchen too formal. What would you suggest? Wendy: I suggest Bianco Romano, it looks gorgeous with cherry wood and will provide the contrast you're looking for. We are putting in a new galley kitchen that is 12' but 21' with dark cherry wood cabinets that are reddish brown. We were thinking of going with crema boudeax granite or as altenatives golden fantasy or new venetian gold. Which do you think would look best. We did not choose a floor yet but are leaning towards light colored porcelan extra large tiles (depending on backsplash colors). Do you have any ideas for backsplash tile? Beth: I'm leaning towards a color with some golden hues. The Golden Fantasy would be a gorgeous choice that compliments your cherry wood nicely. For backspalsh, I recommend a noce tumbled travertine tile. Goodluck! We just installed natural cherry cabinets (they have a light honey spice stain to seal the natural color) in our kitchen, which is about 11.5' X 15'. The kitchen flows into our family room and both rooms receive light from the southwest. The family room furniture has fall colors--warm reds, forest and sage greens, some gold. Both rooms will have a distressed maple floor with a warm-brown stain. Can you suggest a color of granite that would tie into these tones? We've thought about two widely different stones: verde marinace and jumparana florencia. Thanks for your help! Jane: I'm leaning towards the Juparana Florencia for your design. Another option could be Crema Bordeaux. These warm colors will make the granite a center piece of your kitchen with their rich pattern. Thank you for your response to my inquiry regarding a granite color for a cherry wood kitchen with a medium dark stain (reddish brown). I was trying to stay away from the bronze/gold/yellow look and keep to more of the neutral tones but have some life and vibrance to the granite. What do you think of Juparana Crema (I know it has many variations and sometimes is called juparana crema mara I believe). It is cream colored with hues of dark grey, light grey, tans and a bit of the brownish red in the cabinets. Your feedback is much appreciated. I really need your advice on a granite counter color choice. We have a rather large kitchen (20 x 24), with an L-shaped center island and counters that wrap around one end of the room. The floors are saltillo tile, with natural shades of orange and burnt orange. The cabinets are almond formica, with medium-toned oak trim. The refrigerator and wall oven are stainless steel. We want ot replace the counters (about 110 square feet) with granite -- but what color to choose? Light with flecks of brown? Dark green? Help!!! Sherwin: I'd use a lighter granite color with warm golden tones. Some excellent suggestions for you are: Santa Cecilia Real, Giallo Napoleone, and Giallo Ornamental. These choices will compliment your almond cabinetry beautifully. We are currently in the process of picking out cabinets, granite, and lighting to remodel our kitchen. We have maple floors which will be refinished and thought that cherry cabinets would compliment the maple well. What color of cherry would you suggest? And what color of granite to compliment them both? And last but not least, what would you suggest for a backsplash? Our kitchen is smaller--about 11x11 and north facing. Thank you for your suggestions. Vicky Johnson: I recommend cherry cabinets with a mahogany finish and Santa Cecilia Real or Giallo Ornamental granite. For backsplash, a tumbled Noce travertine tile would look wonderful. Hello. We are in the process of designing a new house. We have selected cider hickory cabinets and a gray-brown tile look vinyl floor. Our kitchen will not receive direct sunlight but will be open to two rooms receiving much northern light. I like several of the granite colors that include blacks and browns. What would you recommend and do you have any suggestions for paint colors? I generally stick with tans for warmth but any recommendations would be greatly appreciated! Also, as we have small children, what edge is the most durable? Thank you! Forgot to add- we will be using stainless steel appliances and our kitchen includes both a peninsula and an island. Thanks! Sarah: I recommend Tropical Brown, Baltic Brown, Giallo Vicenza, and Giallo Veneziano. For an edge, a half beveled or quarter rounded edge would be most suitable for your family. Would you recommend a different granite color for the island for contrast or stick with the same? Also, any favorite paint colors for the walls and ceiling? Thank you so much for the assistance! I have natural birch cabinets (no stain) with stainless appliances and a mostly whitish (with a hint of grey) tiled floor with black diamonds every few tiles. What color granite would work best?? Ally: Are you consider a dark or light color of granite? For lighter choices, try Santa Cecilia Real, New Venetian Gold, and Giallo Napoleone. For a contrast, some darker suggestions are Giallo Vicenza, Tropical Brown, Pocono Green, and Tan Brown. Hope this helps. Joyce: For backsplash, I recommend a tumbled Noce travertine tile. Joyce: My suggestions are Ibere Crema Bordeaux, Orion, Costa Esmeralda Italy, Astoria. We are completely redoing our galley kitchen which will have light birch cabinetry and satillo tile floors stained in spanish oak. almost Mediteranean or Morocan looking. Our kitchen has a bay window that faces west and receives plenty of light. I am boggled by what color granite tops to choose, my fear is of being to matchy to the floor/too contemporary/shiny/ or Momish. HELP? Kevin: You can use a rich and exciting color such as Ibere Crema Bordeaux, Kosmus, Crema Beach, Costa Esmeralda. Hope this helps! Hi - your forum here is wonderful! We are doing a full kitchen remodel in a 15x8 space with a window on the north wall and a single glass door on the south wall. We ordered natural birch cabinets in a shaker style and want to use brushed stainless steel hardware. We have ceramic tile for the floor that has variations of tan, cream, gray, and a reddish brown. Our appliances are white. We are interested in a granite that will contrast the cabinets, but not bring in too much (if any) peach and orange tones. Ideally, however, the granite would have some traces of color that would blend with the cabinets, so that its not such an abrupt contrast. We're sufficiently stumped on a granite and paint color selection for the space. Any guidance would be great! Many thanks! Which store has more of a variety of different styles of granite? You want to contrast your granite choice with your natural birch cabinets by going a little darker. Might i suggest one of the Bordeaux's or something more consistent like Giallo Fiorito. Ideally, you should see the granite in person, its the only way you will be able to tell. My kitchen remodel is starting soon and we have specified a creamy white custom cabinet (but it's been difficult choosing the right white), hardwood floors with possibly a darker stain, SS appliances. We have chosen Platinum Bahia, which I dare say is the most gorgeous thing I have seen in my long and stressful search! In your opinion, how do you think this will look on light cabinets? The pics you have in our gallery show it on a dark cabinet, giving it a very formal look. I have a south facing kitchen window above the sink area and a west facing bay window in the dining area. The Platinum Bahia will also look stunning in a white cabinet. It will be a strong contrast and offset the cabinets, and this will make your granite the centerpiece of your design. The floors should be a darker stain to compliment the Platinum Bahia. I love the idea of white or off-white cabinets paired with the Platinum Bahia. I agree that dark cabinets and the PB looks formal, but I feel the light cabinets will give your kitchen a timeless and always classic look. I agree with Derek that your floors should be darker to bring a beautiful balance into the space. Hope this helps! Thank you for your reply. It's nice to hear what you say and has validated what I was thinking all along! Yup, I need to go darker on the wood floor. Any suggestions for stain color? Oh, also, what is your suggestion for a backsplash? Travertine? Tumbled? Yes, a tumbled Noce or Mocha travertine tile will look beautiful against the Platinum Bahia. You're on the right track! A dark walnut or coffee brown stain will compliment and tie-in the Platinum Bahia. Hope this helps. You're going to have a stunning kitchen once it's all done. I would LOVE to see photos of the finished project! Give me information on the other aspects of your design. What kind of countertop do you have? What is the cabinet color? Wall color? Then I'll be able to give accurate recommendations. Thank you! Hi! This is a very informative page! Perhaps you can help with my granite selection. I have medium oak cabinets that I will be keeping, and a beautiful new warm oak floor. The cabinets are very nice, so there's really no reason to replace them. My kitchen is fairly large, approximately 20 x 24, including an area for a breakfast table. The kitchen opens to a family room, and has west windows that let in a moderate amount of light. We have black appliances. I have looked at several of the lighter granites, thinking that I should stay lighter due to the dark appliances and medium wood tones of the cabinets. But the samples don't look good in my kitchen. The Santa Cecilia and Bordeaux granites look too busy, Colonial Gold or Cream look too light. The tones of Giallo Napleon look too beigy/gray to go with the warm tones in the in the kitchen. The color that really "pops" with my cabinets is black. I love Volga Blue in the kitchen. Will this be too dark, and is a warm oak with black granite too dated, particularly with black appliances? Thank you! I do not feel the dark granite against oak cabinet is dated. I am noticing more people are starting to use different color appliances like black or white instead of the usual stainless steel. Because your cabinets are light and so if your floor, you can use a dark granite like the Volga Blue to provide beautiful contrast and balance in the space. It’s a stone that will definitely “pop” and “steal the show”. I saw go for it! You may want to consider using a light backsplash like a tumbled marble to make the stone stand out more. Let me know what you think! I am having difficulty selecting granite and flooring. I love scabos travertine in a versaille pattern and I love the look of a barricato granite counter top. If the floor has a lot going on, should you stick with a more netural countertop? I happen to have the same tile on my office floor and 5 desks with different granites. The desks with the busy granite patterns feel quite overwhelming while the consistent, easy-on the eyes stones seem look best against the busy floor as it balances the space. You may want to consider using a different stone or floor if you don’t want the space to feel it has ‘too much going on’. A great way to utilize the granite you like is to use your favorite stone on the island and a neutral stone like an Absolute Black on the perimeter if you have the space. Let me know what you think! Dark colored countertop on a rich, oak cabinet is actually a very elegant design. My recommendations are Tropical Brown and and Blue Eyes. The Volga Blue is also a sound choice that will compliment your set-up nicely. It's best you look at the slabs in-person and bring samples home with you to see how they look against your cabinets. Good luck! hi there, i have a question. im planning to remodel my kitchen and i have the weirdest combination in my family room that is almost attached to the kitchen and dining area. i have 2 black and 2 red couches, ive tried to accessorize them with silver and grey. now my walls are beige and my kitchen cabinets are medium oak, which means they are lighter in color. i ned some suggestions for the granite. should it be lighter or darker? should i paint my cabinates in dark cherry and lighter countertops? or is it going to be too hotch potch with my dark furniture? or should i leave the cabinets as it is and i should go for some light brown countertops? Can you provide us with a picture(s) of your kitchen and dining room areas? If it's not possible, I'll go from what you've said and do my best to give you some great suggestions. Let me know. I agree. A photo will give us a better idea of the setup you are working with. We have maple cabinets in "autumn" (a medium color). Looking for light-colored warm granite that contains amber colors (to complement the cabinets) and maybe a splash of black or dark brown in veining or spotting. We don't (and won't) have SS appliances, so I really want to minimize the gray in the stone. Appliances are bone/biscuit, and we are leaning toward a beadboard backsplash. I realize this is contradictory to the point of the article, but I would really love to hear your suggestions -- what granites might you suggest that we consider? Thank you for your time and suggestions. Forgot to add ... We are willing to go with a granite that is relatively dramatic, priced in the mid-range. We are not looking for consistency in pattern that would could get in, say, manufactured quartz. We budgeted for quartz and have changed our mind. Thanks again. Sue, my recommendations for you are Astoria, Sunset Ivory, Brown Alpine, and Golden Dream. Let me know how you feel about these granite choices! Looks like great suggestions. Thank you so much! Thank you for these articles...they have been very helpful to us in our planning! Despite what we have read here about selecting the right colour, sometimes it is not practical to simply redo wall and cabinet paint colours easily. We have a century home with trim, wainscotting and cabinetry (and lots of it) which is painted "cabinet maker's blue." (an Old village colour). We actually quite like the colour so while we may consider painting everything ivory, we would like to consider a light granite colour that would complement this current cabinetry. The cabinets are solid and wonderful and as much as it would be great to install a "new kitchen," they are historic and practical and we cannot bring ourselves to send them to the landfill when they have served our families well for 140 years!! We only need about 35 sq. ft of granite but one of the runs is almost 11 ft. Our main consideration is having something natural to fit in with the nature of a somewhat humble old farmhouse. The floors are a caramel coloured hardwood and we are happy to make decisions on wall colour and backsplash later based on the stone and cabinetry. We would be appreciative of any and all suggestions for our soon to be purchased granite. With thanks! Have picked out Thomasville Cotton white cabinets - - but have white appliances. What granite and flooring and wall color could pull this together into a beautiful kitchen. Have plenty of light. Kitchen is open to living room - which has white surround fireplace - with gray/green tile . Burgandy/rose/green colors in furnishings. Alot of windows overlooking a park with pond and alot of trees. Want kitchen to keep airy look but not look cold. (we had water damage so our kitchen came out and we are trying to quickly get a kitchen put together again - so hard to pick everything out in such a short time.) Would like granite or engineered granite counter tops. Would appreciate any help you can give us. Thank you so much. Betty P.
I have honey oak cabinets and have picked out giallo fiorito for my granite. I will have black with stainless steel appliances. My husband wants to add tile flooring that has a square border design of glass accent tiles with solid horizontal tiles in the middle. We also bought the same trimming accent tiles in a different pattern but same colors for the walls with the smaller tiles to put in between. Is this going to be tooo much I have a realitively small kitchen 10 X12.. also if we do go with this would you recommend a backsplash of 4 inches or none at all ... lastly a friend suggested since we are already adding a design on the floor that we should just do a full backsplash of the granite. What are your thoughts? Thanks. My recommendations for you to consider and look at the slabs in-person would be Astoria, Sunset Ivory, and New Colonial Dream. I've created a Comparison Chart for your reference: http://www.marble.com/material-compare/1526,1505,1562 These options will create the warmth and an inviting atmosphere for the traditional, Old World feel you're trying to achieve. Hope this helps! Can you upload a picture of these tiles or provide a website link? That would be really helpful in giving you appropriate advice. Thanks. Since you like glass and travertine, I recommend a mosaic mix of these two materials. This would be very warm, casual, yet appropriate and timeless for your design. I've attached an image for your reference. This is called a Cappadoccia tile. I like Derek’s flooring suggestion. A warm floor paired with a Bianco Romano or Bianco Antico would give your kitchen that airy, warm feel you are after. Let me know what you think! In addition to Derek’s fantastic suggestion, check out Anatolia Bliss Cappucinno Linear Mosaic and Anatolia Bliss Bamboo Mosaic by SouthCypress. I feel these suggestions will finish off your kitchen quite well while giving you that fun and causal look you like. Let me know what you think! Has anything caught your eye so far? Do you like a tight, speckled pattern like the Blue Pearl SP or a stone rich in veins like the Silver Waves? If you could provide us with your likes and dislikes, we will be able to provide you with some wonderful suggestions. Looking forward to hearing from you! We are looking at remodeling our kitchen and are having a difficult time selecting what granite and backsplash we should go with. Our current cabinets are a medium shade of cherry we are also adding some additional black cabinets. Any suggestions you could provide would be greatly appreciated . I’m assuming you are not replacing the existing tile so I would recommend painting the baseboards white and keep one color throughout the space. Since the tile seems busy, I would recommend painting the bath a warm, neutral tone like Benjamin Moore’s “Lancaster Whitewash” or “White Marigold”. Generally, people want a peaceful and serene feel in bathrooms which can be achieved with easy on the eyes paint. If you start adding accent walls, the space may start to look overwhelming and just too busy. Let me know what you think! Have you seen any stones you like so far? Check out Crema Bordeaux, Madura Gold and Santa Cecila Real. If you provide me with your likes and dislikes, I will be able to provide you with more amazing granite options! Kinga's suggestions are spot on. Some other colors from the BM line you may want to look at are "Mayonnaise" and "Ivory White". The Giallo Fiorito would work if you go with the darkest shipment you can find. I’m afraid the colors may blend too much with your cabinet color should you decide to go lighter on the countertop. Have you considered something darker like Bahia Brown, Black Pearl or Ubatuba? If you want a sleek contrast, going darker on the countertop may be the way to go. Let me know what you think! Make sure to look at the deliveries of Fiorito your fabricator carries in-person to see the slabs, and bring a sample home to put against your cabinets in the kitchen light to see how you enjoy the combination. In addition to the Fiorito, my recommendation for you would be a granite called Boreal. I recently saw a sueded fiorito that was gorgeous and darker than unsueded fiorito slabs - you might seek it out if you like the look of that stone. We are remodelling our kitchen, but keeping the medium honey ash cabinets. They have a definite grain pattern. We have black and stainless appliances and a gold/cream/ivory tile floor. What granite do we choose? We have considered Amarillo Boreal, Portafino, New Venetian Gold, and Santa Celia. Your input is greatly appreciated. I’m leaning toward the NVG for your setup. Since the cabinets have grains, the NVG will compliment them and even tone them down a bit. I feel the other granites are just too busy for you so my vote is for the NVG. The classic and popular choices are New Venetian Gold and Santa Cecilia, but for a darker shade for an elegant contrast would be Amarello Boreal. I do not feel it would be too busy, but if you're looking for a warm and airy space, then definitely go with one of the first two. Good luck! We are remodeling our kitchen and adding granite counter tops, I am have a hard time picking a color. The cabinets are glazed maple and the floor is Brazillian cherry. There will be a large one level island that is 13 feet long and 48" wide at the widest part (there is a curve). A copper sink will be in the center of the island. The room doesn't get much natural light, so I would like to avoid extremely dark colors. The image below is a "before" picture. The microwave will be replaced by a copper hood or a wood hood with a copper accent. The backsplash will be replaced with some type of tile, I could use help on that too! The island will be all one level, and the cream cabinet ends on the island will be the same maple as the cabinets. Please help! I love granite with brown such as golden crystal and persian brown, but I am afraid they will blend in too much. I have considered colonial gold, but it seems too light. HELP! My recommendation for the backplash in your new design would be a white subway-like tile for contrast to offset the dark granite with blue or green shaded inserts to add a little color and excitement and to pick-up the counters. I've attached suggestions of Marine marble in a brick pattern, and Thassos marble with Blue Celeste inserts. Good luck! The Persian Brown would definitely be a statement maker in your space. I’m not a fan of the Golden Crystal because I feel it will blend too much with your cabinets as opposed to the Persian Brown which will give you some contrast. Also check out Canela Bouquet, Crema Bordeaux and Juparana Exotica. What kind of backsplash are you interested in? Do you like porcelain, natural or mixed mosaic? For a classic look, a tumbled Bottocino marble tile or Crema Marfil Classico Split Face Mosaic would be an appropriate choice. For a more modern feel, a white subway tile would also work quite well. Let me know what you think! To make the granite a focal point in your kitchen design and make the island stand out, my recommendations are options such as Lapidus Classic, and Jacaranda Wood. If that's too busy for you, softer patterns such as Ivory Fantasy are also appropriate. Lastly, I agree with Kinga that Persia Brown is a wonderful choice and would look very nice in your set-up. Well the good thing about tiles is that they are fairly easy to replace. So in case you truly, absolutely hate it years down the road, you can change them. The granite you picked is timeless and classic so whatever you chose (if you change your mind) it will work just fine. Check out Innova Snowy Owl Magic Border and Ice Lava Random Brick Border. These suggestions are light, fun and will not make the space feel smaller. Let me know what you think! I am redoing a family room / den that has a traditional red brick fire place. Opened up the two rooms by creating a 8 foot pass through cut out in wall and will use lower half of remaining wall as bar top with bar stolol seating on both sides with pendant lights. The room has a very traditional style with white wainscotting and trim moldings around room and bar top wall. Can someone pplease help me with a color for the granite bar top that will go with the white trom and red brick fireplace in room? Thank you. HELP!! Christian, are there any granite colors you've looked at so far that have caught your attention? Do enjoy movement and veins in the stone or a more consistent, speckled pattern? I'm remodeling my kitchen with grey blue ceramic tile, honey maple cabinets, and stainless appliances. I can't decide on burlap, copper, tan, or light blue walls. I want to try to match off of the countertop. I thought I wanted granite and like the medium sized patterns in silver brown or silver black. However - I need a durable countertop that might handle a hot pot that is placed there by a teenager. Please help. We recently bought a ski condo with gaillo fiorito granite countertops and honey oak cabinets. The kitchen has a dropped ceiling as part of a large A frame space that contains the den (with large natural stone corner fireplace), dining and foyer space, so it tends to be a little dark. Now there is no blacksplash. I can resurface the cainet, unfortunately they are in great condition! What do you sugest for a backsplash...multicolor tiles seem too busy but noce seems too dull. Would making the cabinets a darker color help or would it make the already kitchen too dark...I plan to upgrade the applicances to stainless in a few years as they play out. Also plan to take down cabinet beside range hood and make open shelving to add interest. Any other suggestions? ?Thanks so much! First, i'll start with the countertops. Granite is heat resistant and once sealed it's stain resistant and quite low maintenance. If you're still concerned and want full peace of mind, then I recommend to look at Caesarstone. It's totally maintenance free and has consistent, dark, speckled options like the what you're looking for. Take a look here: http://www.marble.com/materials/quartz In regard to the wall color, my recommendations are Benjamin Moore line neutral, soft tones such as "Navajo White" or "Linen White". To create a warm, log house feel I'd use options such as 2" x 2" tumbled Sienna Gold or 2" x 4" Jerusalem Gold beveled marble. They're not too boring or neutral, but have warm tones and interesting colors, however they are not too busy or dark. Just some food for thought, and I've attached pictures to show you what I mean. Any reasons why those colors do not suit you? I'm trying to find a style that will fit your needs. The Santa Cecilia and NVG are class and timeless choices, quite popular. Another one you could try is Giallo Napoleone, it's a little different. Your backsplash has a little movement so the stone should not be too busy. Have you thought about a sleek and elegant darker color? Perhaps Ubatuba or Golden Jade. If that's too dark, try a happy medium such as Giallo Antico or Tropical Brown. Hope this helps. We have cherry cabinets throughout in the kitchen and our counter top is black granite with sparkles of orange and small spots of grey. Our floors are cherry wood also. I tend to like cooler airy feel but the way the house was built is on warm hues. I would like to tone down the cherry with new drapery and cushions. But in what color? Didn't mention that when I did put the Santa Cecilia and others above next to my tile that my tile turns pink or has a pinkish tone. I am leaning towards the Magma/Stormy nights but the fact that you said the stone shouldn't be too busy (which was one of my orginial concerns) has me thinking that Star Beach (found this weekend) might be the better route. What do you think of Star Beach? I'd use a creamy beige color tone for the drapery and cushions OR a warm golden tone that picks up the sparkles of orange in the granite. Either of these shades should brighten up the place nicely. Good luck! Hi, I purchased Giallo Fioriti countertops for my preexisting cabinets but after we removed the laminate the frames got damaged. Decided to get new cabinets keeping exact layout/measurements. Went with a bretwood maple medium cabinet. Floor is 16X16 glazed walnut porcelain tile, back splash will be a mix of the same tile (smaller size) and glass mosaic tile. Need some hints on what the wall color should be. You're on the right track with the various design elements. For the wall color, my recommendations would be from the Benjamin Moore line of colors. Take a look at Linen White or similar bright and airy shades. i am so confused. i have a retro yellow tiled bathroom with beige upper walls. the floor is a pattern of off white and and a caramel color there are also random white tiles throughout the yellow tiled walls. i decided on a white vanity, since the room is too small to introduce wood. but WHAT color vanity top ?? i would like granite, and in my brain i see white with yellow veining, but how do i know for sure what will look good ? I have white cabinets, oak floor and stainless steel appliances and need help with a granite choice. I'm leaning toward the Gallio Vicenza because I want the contrast without going too dark. Would this granite go well in this situation and are there others you would recommend? Thanks. Need help with granite choice for my master bathroom countertop. I already have travertine floors (cream pinkish travertine). The shower wall is also travertine. I love Kashmire White granite because it is a very light gray-blue color but not sure if it would look nice with the travertine floors and shower. I was also thinking about Travertine countertops but I´m afraid because everybody says Travertine is not good as a countertop. And my last option would be a Napoli or Santa Cecilia granite. What would you recomend? Thanks. You know for sure by visiting a granite yard! You must look at the slabs in-person to choose the stone that attracts your attention and fits the design nicely. You should bring samples home with you to put them in the bathroom against the vanity and your other design elements to see how you enjoy the various combinations. From your description, I can give you a few suggestions. Take a look at options such as Santa Cecilia, Kashmir Gold, Tiberious, New Venetian Gold, and Giallo Napole. Giallo Vicenza is a wonderful direction to go in for a warm and timeless granite! Some other options you can consider that will offset the cabinets without being too gloomy are Tropical Brown, and Toffee. Hope this helps! What color is the vanity cabinet? I am having a vanity custom made with a dark stain. I have selected Verde Monarch granite, but am worried about the dark countertop on a dark vanity. The floor is a blue/green tile that looks good with the granite. Shower is a lighter grey porcelain tile. Should I go lighter on the countertop, or is bringing in the floor color the right way to go? I can attest that Verde Butterfly looks great on a dark cabinet wood color. Some other recommendations that are similar and would compliment your design elements are Golden Jade and Butterfly Antique. Either one of those is appropriate. If you feel this set-up will be too dark and gloomy, a lighter choice for an efficient contrast would be Giallo Ornamental or Santa Cecilia. I'd acquire samples of the dark and light choices and try out both combinations in the space to see how you enjoy each before making a final decision. Good luck! I am redoing my bathroom... Floor and half wall is tumbled noce travertine.. sink/toilet and tub are white.. walls ben moore cocoa butter... NEED HELP with granite top... Vanity is java color... HEEEEEEELP! any ideas? I'm leaning some warmer tones in the granite therefore the Giallo Napole or Santa Cecilia are attractive to me in your situation as stellar choices. The Kashmir White could be a little too cold and neutral. For a stone with a similar pattern and style to the Kashmir but warmer highlights, take a look at it's counterpart called Kashmir Gold, as well as Astoria. Good luck! We are looking for a granite that has brown in it. Prefer veins and a marble type look. Furniture is espresso brown leather and so will the stools be an espresso brown. Walls are neutral beige with traditional gold framed mirror and artwork in room. The bar is painted white , the smae color as all the trim and moldings in room. You could use a darker granite for the vanity top for an elegant contrast. Take a look at Butterfly Antique, Imperial Coffee, Ubatuba. Let me know your thoughts on these. For warmer, lighter options, I'd use Santa Cecilia Real or Giallo Napole. Shop around and see if the fabricators in your area carry granite colors such as Astoria, Sunset Ivory, New Venetian Gold, or Giallo Ornamental. These are light yet warm choices that are appropriate for your design. Good luck! Take a look at options such as Astoria, New Colonial Dream, Sunset Ivory. Report back with your thoughts on these suggestions. I have bleached maple cabinets and I am thinking of using Amadeus or Verde Butterfly (maybe Verde Laura). It is a large open layout kitchen with a back wall of windows so I don't think it will be too dark. What color tile should I use for the floors. Surrounding the kitchen are bleached oak floors with black furniture. Should I go for a creamy colored flooor to blend with the surrounding wood floors and cabinets so that the countertops stand out or should I balance them with a dark floor (charcoal for Amadeus or a green color with the Verde). Help please - I feel overwhelmed. If you have an open kitchen on the larger side, with plenty of natural light, then I'd use a darker floor tile to compliment and pick up your granite choice, which I think should be Verde Butterfly for an efficient contrast. You should look at the granite options in-person as full slabs and bring samples home with you to put against your cabinet color in the kitchen light to see how you enjoy the various combinations. Hope this helps. We are refacing cabinets with cider maple, floor is slightly tinted beyond natural oak hardwood..white appliances at the present time although hoping for stainless soon. What color granite? Giallo Ornamental or is that not enough contrast. I am worried about going too dark with the white appliances. Also, what color paint would you suggest? Thanks! What a great forum you have here! We have maple cabinets tha,t to me, have some orange-y undertones to them. as does the tile floor in the kitchen. The walls are BM Nantucket Grey. In January my husband gave me the go-ahead to pick out some granite countertops to update the kitchen. It's April, and I have "dated" many granites, but have struggled to find "the one." I go back and forth between light and dark, I feel like I just need someone to say, Kristen, this one is perfect for your space. It is a very bright kitchen...if this helps. Any suggestions? Maybe a backsplash recommendation too? Thanks so much!! BTW, I also plan on replacing bar stools and curtains (with a roman shade). I think Giallo Ornamental is quite appropriate for a warm shade to create a balance in the design. Another option could perhaps be another color from the Giallo granite family -- called Giallo Antico. What about Ubatuba or Verde Butterfly - that always looks striking in pictures. What would you recommend for a paint color and backsplash with the uba or verde? I think we will be switching to stainless appliances. Do you recommend ignoring the appliance color when choosing the other materials? Thanks for your post! Kristen, are there any options that have caught your attention so far? My suggestions for you are choices such as Azteca, Imperial Coffee, Tropical Brown, and Golden Jade. For lighter suggestions, I recommend to consider Santa Cecilia Real and Colonial Cream. Let me know your thoughts on these and we'll try to narrow it down. In regard to backsplash, you should really settle on the countertop choice first before picking that as they usually play off each other. Ok, here are some of the ones I've looked at...Golden thunder, cosmos, saci, bianco antico (saw it a Home depot and loved it with the dark cabinets they have on it), tropical green, and my husband loves verde peacock (we had it in our last house in AZ). I have seen some juperana vyara that's nice too. It's hard for me to look at a slab an envision it on my counter. The cafe imperial is not bad too, I saw some with a tumbled stone backsplash that was nice; also saw a santa rita online that looked nice. (totally right that I need to focus on stone before backsplash :) ) I am afraid of picking something that is to generic. I think I lean more towards the darks for the contrast, I love the lights but don't think it would work so well. Do you agree? My budget has a little room because my dad is friends with a stone distributor and we are getting it at cost. BUT I have to buy by the slab, not just the sf, which I need 55-56 sf. Which probably means 2 slabs? Thus, if its a pricey slab, ?shopping some place I can purchase it by the sf? It should be so exciting...perhaps if I could make a decision! The Ubatuba and Verde Butterfly would surely create an effective, striking contrast to offset the cabinetry. These colors are timeless and durable therefore I recommend them strongly if you're now leaning toward a dark granite color. For the backsplash, a tumbled travertine tile is appropriate, such as Puetro Gold or Walnut Fontane (I've attached photos). In regard to the appliances, stainless steel is a classic choice that fits in with almost any design to add a contemporary touch. I recommend to visit stone yards in your area to look at the full slabs in-person to truly see and visualize the countertop design as looking at photos will not get you far. A dark contrast is very elegant and seems appropriate for your set-up, I like choices such as Imperial Coffee, as well as Cosmos. When you see the slabs, acquire samples of your favorites to bring home with you to put against the cabinets in the kitchen light to see how you enjoy the various combinations. Hello, I am remodeling my kitchen and would like to keep it light with an old world feel. I have a Versailles pattern stone floor that is fairly light with hues of brown/black, cream and peach. My new cabinets are Woodmode's French Vanilla and the appliances are stainless with a white apron sink. The backsplash is beveled Arabesque white and cream, alternatley and probably 4" each piece. I really want to use Delicatus or Bianco Antico stone, but will it all be too monocromatic? I do love the idea of light as I live in Maine and light is a premium. I have considered using a black hewn as well, though it may not give me the feel I'm looking for. Any help would be appreciated. Thanks. A light, warm stone seems like the perfect fit for you and would compliment your kitchen set-up quite nicely. The Delicatus granite is an interesting choice, as it has some burgundy bursts throughout the slabs for a beautiful accent. The Bianco Antico on the other hand is a cooler, more neutral choice. Also I recommend to check out Astoria. Good luck! My parents are in need of new countertops and are looking at granite, but are having a hard time deciding on what goes will look best with their cherry cabinets and current flooring. I know my mother would prefer it to have a smoother look rather than too splotchy and neither of them can decide whether they'd like to stay with a lighter counter top or darker counter top. They will be replacing the hardware as well. What would some of your suggestions be for either a light or dark granite counter top. I'm leaning toward a light, warm, and creamy countertop choice. The suggestions I have in mind are the following choices: Sunset Ivory, Astoria, and Colonial Cream. I've created a Comparison Chart for you for easy viewing: http://www.marble.com/material-compare/1658,1666,1562 Let me know your thoughts on these! What countertop granite choice would you suggest to use with light, soft sage green cabinetry, medium oak floors, and lots of windows but lots of trees so the amount of light in the kitchen is somewhat muted? I have a few suggestions for you that could be optimal. Take a look at options such as Santa Cecilia Real, Golden Jade, and Ubatuba. Both light and dark choices that would look very elegant. Hope this helps! I'm leaning toward a soft, light yellowish tone such as Benjamin Moore series Lemon Souffle or Butter. I'm having a difficult time deciding what color of granite to use in my kitchen. I'm replacing the appliances with black ones and the appliances and the countertop is all I can afford to do right now. The cabinets are light oak and the floor is 12" cream tiles. The walls are cream color. The existing backsplash is the smaller tiles in cream and I would like to keep it because there is a mural painted on the backsplash behind the stove and on a few additional tiles. Sounds boring as I write! I'm thinking of something darker for the countertop but am afraid of going too dark. Also want to not have it all the same cream Help! I am having a hard time deciding what color granite countertops to install in my kitchen. I have fruitwood stained ash cabinets and mexican saltillo tile floors. I am leaning toward a giallo granite...is there one that you could recommend. Yes, it does sound really neutral because of all the creme color tones in the design. To add a little creativity and flair while providing a contrast against the cabinets, I recommend choices such as Crema Bordeaux or Brown Alpine. For a more elegant and consistent pattern, you can try Brown Bahia or Imperial Coffee. Good luck! Hello. My recommendations for you to consider from the Giallo family of stones would be Giallo Vicenza or Giallo Napoleone. I've created a Comparison Table of these two choices for a side-by-side easy reference: http://www.marble.com/material-compare/997,985 Hope this helps! Your ideas will be so welcome because I have fallen in love with too many granites and need to decide on one that will be new buyer friendly. I wasn't expecting to remodel until next year and was not able to get my choices in order beforehand. I just put16"x16" Rialto noce porcelain tiles (with dark gray grout) in the entry and powder room (off the kitchen) and connecting halls. Am doing the same with the kitchen. Appliances are SS with black accents; walls are an old Spanish red (La Fonda Antique Red, from a National Trust series), with white sink and coffered ceiling. The new cabinets are a rich carmel maple edged with chocolate brown. Essentially, the floor and ceiling are light, the counter top is in the center (vertically) banded top and bottom by the carmal/chocolate cabinets. The wall color only shows from the bottom of the wall shelves to the countertop. Being the visual middle point of the walls, should the center countertop line be light or dark? My granite choices so far are Sivakasi, Golden Garnet, Kashmir Gold, Giallo St Cecelia, and New Venetian Gold. Nothing too "chuncky"or with lots of dramatic movement. I've taken paint and cabinet samples into the field with me. However, are these granites too light or too close to the cabinet color? Or should I go darker? The deep green granites are lovely and there are some browns that I like. Would tumbled travertine tiles work for a backsplash even though they are quite matte? And would they work above the electric range? What about cleaning? I also found some smaller irridescent tiles that might be better above the range, but am not sure they would look that great with the lighter granite choices. So many colors and textures; I have never had such a difficult time. Thank you for any suggestions you can share. Hello John! Sorry for the late response. In terms of engineered quartz as a choice, it's an elegant and contemporary decision, that's for sure. I recommend the Caesarstone line, with colors such as Buttermilk, Baja, or Linen that could be appropriate choices. I've created a Comparison Chart of these suggestions for your easy side-by-side reference: http://www.marble.com/material-compare/1144,1186,1670 Hope this helps! Thank you Derek. Those are are all good choices. I was thinking of Zodiaq Quartz Crema Marfil which seems similar. I didn't want to use the Marble Crema Marfil. What do you think? Best Regards. Well, the Zodiaq is an engineered quartz stone line of products, just like Caesarstone, so I recommend it over real marble in a bathroom application as it's such more durable, stronger, and non-porous. Go for it! Hello. It seems like you are trying to achieve a tranquil, sleek, elegant, contemporary, and sharp look for the bathroom. It's hard to create this feeling because you must balance various design aspects at once. It seems like you're on the right track and know what you are doing! :-) We do not carry Cambria engineered quartz line but I did a search online and found the Durham shade you are considering. It's a nice color on a very dark background but with gray undertones which reminds me of a night sky. We carry the Caesarstone line of artificial quartz so I have experience with those colors, and my recommendation for you to consider would be Absolute Noir. I've attached a photo for your reference. Hope this helps! Hi, we are remodeling our kitchen and are having a difficult time chosing a vinyl floor color, wall color and tile for the backsplash. The cabinets will be Maple - cinnamon is the color, appliances are stainless steel and we have chosen saint cecilia granite as our countertop. What would your suggestions be for a color/pattern for the vinyl floor, wall color and tile backsplash? We would like to incorporate some colored glass in the backsplash. We would appreciate any advice you could give. Thank you! Hello! My backsplash recommendation for you to consider is called Capadoccia Glass & Tumbled Travertine. I've attached a photo for your reference. The wall color can be soft and neutral such as Benjamin Moore Linen White or you can add some color and wamrth such as BM Moonlight. In regard to the vinyl floor, the Armstrong line seems like an appropriate choice, and the Bolivian Walnut color could complement the design nicely. Hope this helps! How would Bianco Ramano granite countertop look with Cherry Cabinets w/Chocolate Glaze? My walls are currently a greenish-gray color (Richmond Gray) and we are looking at putting in 5"wide Red Oak flooring. Our appliances are stainless steel w/black. I really like rustic deigns with a touch of contemporary. I love the look of slate. Any recommendations for backsplash if we decide to go with BR granite? We are renovating our kitchen and need advise regarding the granite selection. The new cabinets are Shaker style in natural cherry. Although we have not finalized the floor selection, we are leaning towards natural yellow birch. Appliances are all stainless steel with black highlights. The layout is an L-shape with a center island, with an eating area off to the side. There is a lot of natural light in the room along with 16' tall cathedral ceilings with skylights. We keep going back and forth between dark or light tones, and have even considered doing a dark, plain granite around the edges of the room with perhaps a lighter granite with more movement on the island. Any thoughts you have would be greatly appreciated, especially your opinion regarding one granite style vs. two. If we go with a single granite what would you recommend? Similarly, what two granites would you recommend if we decided to go for that option? We are not yet committed to the yellow birch floor selection so if you have an opinion on that also we'd be happy to hear what you think. The Yellow Birch hardwood floor is fine to offset the Natural Cherry cabinet wood shade. In regard to the countertop selection, if you have a large island then it would be nice to show it off with a stone that is rich in movement and veins to accentuate the island and make it the centerpiece of the kitchen design. 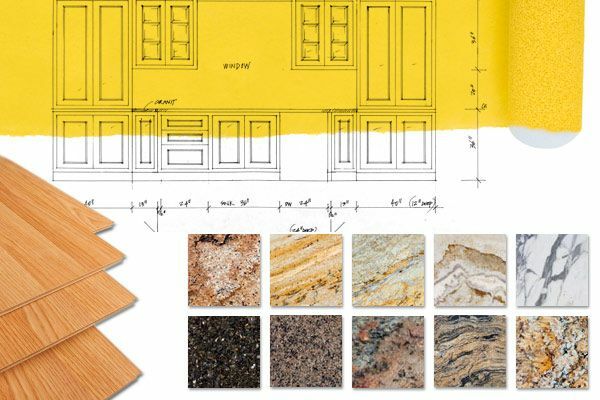 An island countertop could be colors such as Crema Bordeaux, Delicatus, Netuno Bordeaux, Exotic Gold. For the perimeter cabinets, a practical and timeless countertop choice is appropriate, with a consistent pattern and neutral color shade but still with warm hues. Specifically, I have colors such as Ouro Brasil, Santa Cecilia Classic, or Giallo Napole in-mind. Let me know your thoughts on this. Thanks Derek, I will certainly take a closer look at your selections. We aren't sure about lighter tones so we looked at numerous granite samples over the weekend. We fell in love with Volga Blue. The coloring and pattern seem (to us anyway) to complement both the cabinets and the floors. If we made that selection we would use it in the entire kitchen. What do you think of that idea? Are we right on or way off? If you think it would work, do you have any backsplash suggestions? The Volga Blue is a very pretty color and has flecks of gold in it to complement the cabinets and floor. My only concern is for the set-up to not become too dark. If you have plenty of natural light with a large, open space (which you have indicated you do), then I do not think there should be any problems with this choice. We can make the backsplash lighter and warmer to offset the countertops, for example a tile such as Tilecrest Eclipse series Dunes Linear Glass & Stone Mosaic, or for something subtler, a Mirabelle Collection smoky brown glass tile in a brick pattern, would be appropriate. I've attached photos of these choices for your easy reference. Hope this helps! I don't think we should have any problem with it looking dark because we always have a lot of natural light coming in. I think your backsplash suggestions are great and will certainly tie everything together. Thanks for your help. You're welcome. Best of luck on the project! We have white cabinets in a u shape with a 96 X 36 bar. We looked at the Cosmic Black and loved it but I have concerns if it might be too much movement in the pattern. It had a lot of veins although it is beautiful and looks 3-D do you think it might be too busy in a kitchen with 50 square feet of counter space.I really like it but have not seen it in a kitchen , only the slab . I forgot to ask what color backsplash you would suggest if we do the Cosmic Black. From my experience, the Cosmic Black's movement depends on the specific shipment of the stone available. Some deliveries as less busy than others -- it seems like your choice is a batch with more veins and movement within the slabs, which is absolutely fine but may not be the best choice for your specific situation because of the large size of the countertops. My suggestion would be to also consider the following colors: Ocean Black, Black Diamond, and Jet Mist. Of course, the final decision is up to you and if you feel the stone will not overpower the space then you should go for it -- as color and design wise it's an excellent choice. Do you have anything specific in-mind so far? For example have you thought about glass tile vs. natural stone tile vs. a mixed mosaic? I'll suggest a color of each type of tile: Fire & Ice - Slate & Quartz Mosaic, Iridescent Art Glass Linear Blend, or Andean Cream 2" x 4" Tumbled Peruvian Travertine Bricks. I'm having trouble attaching the photos at the moment, but you can find a photo of each suggestion online with a Google search. Can you please help me with my kitchen? I have white cabinets and I am going to get stainless steel appliances. I just got New Venetian gold countertops and it is clashing with my existing wall color and backsplash. What can I do to tie everything together? Should I change both the wall color and backsplash ? Should I also consider changing the cabinet color? Please advise as to what I can do. Thank you. Hi. You should definitely keep the white cabinets. It's a good design base because a white wood shade goes with everything, and in this situation the contrast between the NVG granite and light cabinet is appropriate. I think you can go with a lighter, simpler, and more neutral backsplash tile such as Baja Durango tumbled travertine, in a 3" x 6" or 2" x 2" sized cut. I've attached photos for your reference. Thank you so much for your reply. So should I get a tile that is lighter than the one I have? What color should I paint my walls? In the backsplash tile suggestions I've attached in my previous response, I feel that they are lighter than the New Venetian Gold, so yes that's one direction to go in. Were you thinking about using a darker tile? If that is the case, then it's certainly an appropriate idea as well. For a darker choice, I suggest to consider something like Fire & Ice - Slate & Quartz Mosaic, or Merola Cobble Noce Ceramic Subway Tile. I've attached photos of these choices for your easy viewing. In regard to wall color, if you choose to go with a darker backsplash, I recommend a neutral beige wall color. Benjamin Moore series shades like Linen White or Navajo White come to mind. Thanks for your suggestions. I like both your ideas. I will get samples of both light and dark tiles and see which direction I want to go. I will post pictures after it is done. Well, a neutral shade would be safe and appropriate. For example, Benjamin Moore series Linen White or Lighthouse Landing are popular choices. Let me know your thoughts on these. I have cherry cabinets, persa brown granite and hardwood flooring in my kitchen and I am struggling with a wall color....any suggestions? Hi-I am in a pickle! I am doing the kitchen with cream cabinets, netuno bordeaux granite and SS appliances. The granite has lots of movement w/ olive green hues and touches of cream and black. I am having a terrible time finding a tile floor color. I am thinking a tan/cream tile since the kitchen floor feeds into medium shade of maple hardwood flooring in the foyer and dining room. I am concerned about too much movement in the floor. HELP????? Can you help me???? Thanks so much!!! Hello there. I'm sorry for the late response. I'm leaning toward a light and subtle wall color for your situation since cherry is a rich color and the Persa Brown granite has a lot of movement. Take a look at Benjamin Moore series Lighthouse Landing and Navajo White. Hope this helps! Hello there. Sorry for the late response. You're on the right track with the floor color selection, I recommend to take a look at tiles such as Daltile series Franciscan Slate Desert Crema and Alta Vista Desert Sand Porcelain. I've attached photos of these choices for your easy reference. Hope this helps! Thanks Derek! I chose a tile in creme which matches your selection on the left. Now paint---I have 20 paint samples--about $75 later and still cannot select a paint color. Do you have any suggestions. I am stressed out over this issue. Thanks! Hi, I'm happy that you liked Derek recommendetion. Regarding to your wall I would recommend you go with neutral colors because colors in a kitchen needn’t translate to safe or boring. Painting kitchen walls a sandy brown, a slate gray or an antique white allows for versatility in color play with artwork and accessories. Please find the attachments with the colours that I have found for you: the first one is Mint Chocolate Chip, Antique White and Sand Beige. Hope this will help ! Our kitchen is 20x12 with a beige/cream congoleum floor. One side of our kitchen has tile which is predominitely white but some tiles to offset it have a blue tulip (with a small yellow flower with it). We have natural color maple cabinets with blue laminate counter top (L shape). I'd like to get a granite top and I was looking at a black with slashes of blue in it but I'm not sure if I'm satisfied with black in the kitchen. Also thinking of picking up the color blue that is in my tiles for the walls with white trim? Am I off base? I have a smaller kitchen in one of those 1986 garden apartments turned condo. I do not get alot of light in the area. I have white cabinets and have chosen verde butterfly for the granite. I have to paint the back splash and small amount of wall space due to financial restaints. The kitchen is rectangle in design with a small rectangular opening you can see into the living area. I dont know if adding a 3 or 4 inch granite border will make the room look smaller since the granite is dark. The choice of a paint color is very difficult for me with this granite. Any suggestions would be appreciated. Hi Joan, Please accept my depest apology in delay of responding but something was missed by the computer. Regarding to your countertop I would recommend you to go with silver granites, which has some blue spots on it with white reflects thanks to such a combination you will emphasize your colours in the kitchen. Please take a look at the stone like: Blue Pearl, Emerald Pearl, Jet Mist, Silver Waves. If you are considering use a black granite then I recommend you to take a look at Absolut Black which will give you an elegant atmoshpere. I hope I could help ! Hi, I really like your balanced combination between white cabinets and dark with green reflects countertop. I think that light neutral walls with green shade will provide a nice complement for the kitchen. Please see the attachments of paint samples: Antique White, Rice Paddy SW 6414 and Celery SW 6421 from Sherwin Williams company. Regarding to backsplash I think that 4 inch hight granite will not make your kitchen look smaller, especially when you give a light paint color. Good luck ! Hi, Please accept my depest apoogy in delay of respoding. At that point it's really hard to give the right recommendation. Could you let me know what kind of color cabinets and countertop do you have ? Also how big is your kitchen, do you have a lot light inside ? These all issues will help me a lot. Right now I can just suggest you that you can go with something light creamy like your chair then you will bright up your kitchen. Please let me know. We are in the midst of remodeling our kitchen with natural cherry cabinets, hickory floors, and countertops made of a granite called Juparana Xotica, which has tan, various browns, beige, pink, thin veins of black, and hints of pale green throughout dramatic waves. We also have in the same room a brick fireplace hearth with washed out reds, beige, tans, and browns. We have picked a creamy color for the walls that has pink undertones but we still have time to change that if we need to. I am wondering if this will look too "matchy". What color would you tend to pick for the walls in our situation? I have other rooms in the house painted with a pumpkin color, roasted red pepper, sage green, and chocolate brown, so it is hard for me to get excited about a cream color. My husband worries that anything darker will be too overpowering. Would love to hear your ideas. Please help me! This is an open concept space with the floor as a cream porcelain tile (in the picture). I must have tried about 15 colors for the walls and finally chose AF 90 harmony by BM for the main color and providence olive as the accent. I love the providence olive by BM but HATE the Af 90. It looks pink and too dark. So I went to get more samples and came back with the ones in the picture. All by BM- muslin, maritime white, sail something I can't remember and French white. I wanted a sandy color but the the first one-muslin is too dark. The next two look too gray, and then the French white almost matches the tile. The kitchen will have dark wood cabinets-more chocolate color-not cherry. I need to find a color for my walls ASAP! I am terrible at this clearly. Please help. Hi, I'm getting ready to start a project in my kitchen wherein we are opening a load bearing wall 1/2 way so we will have a half wall for a countertop and seating area in the kitchen. When we open this wall, my dining room and kitchen will be viewable to each other and the countertop will be in between the kitchen and dining room. I do not have a paint color picked out for my kitchen just yet but b/c my dining room will be viewable, I know I need to get a granite countertop which matches my dining room as well. Right now, I have BM Baked Pretzel as an accent wall and BM Squire Hill Buff on the rest of the walls in my dining room. Whatever countertop color I go with would be resting on the wall in the dining room which has Squire Hill Buff but also wouldn't be too far from the Baked Pretzel accent walls. I have Golden Oak hardwood floors in my dining room. In my kitchen, I have laminate flooring which has very earthy tones such as very pale olive/khaki, very light peach (these colors aren't really noticeable unless you are looking closely) and a soft beige which is more noticeable. It sounds ugly but a lot of people who come over think it's a real tiled floor and I get lots of compliments on it. LOL. My kitchen cabinets are from the late 80's or early 90's and we are unable to change them at this time so we will be keeping them and the current countertops. All of my kitchen appliances are black. Right now my kitchen countertops are a cool laminate ivory color and my cabinets are a shiny laminate or formica pale yellow or yellowish ivory type of material. Are you able to make any recommendations as far as granite colors for me after explaining all of this? From what I have viewed online, I love Giallo Vincenza but I'm not sure if that would match well. I'd really appreciate any info you can provide. Thank you so much! Hope this gives you a better idea of my kitchen floor and type of kitchen cabinets. Here are 2 pics of my kitchen floor (the second picture is lighter b/c it's taken when my kitchen was very bright during the day). The picture of the kitchen cabinets are not mine, mine are more creamy but the same glossy style, etc. Trisha, The Giallo's and the Santa Cecilias would really warm up this kitchen nicely and provide a good contrast to what you have going on while picking up some of your floor wood colors. Ideally you want balance, and contrast, I think that going with a warmer toned granite will balance out your floor with the countertop but also provide a new level by providing more of a layer within your kitchen by brightening it up and adding some warmth. Thanks for the reply. Appreciate it. Not sure if you realized it but the picture above of the kitchen cabinets is not my kitchen. I was at work the day I posted my question and I only had access to pictures of my kitchen floor. I want to be sure you still agree that The Giallo's or Santa Cecilias would warm up my room, so I am posting up photos of MY kitchen since I am able to do so today. Sorry for the confusion. Also, can you give me an idea as what color to paint my kitchen? Over the weekend I had a party and I was told burgundy...but I just can't see burgundy in my kitchen. Not sure if it would definitely go with everything being a wall will be made into a half wall and looking into the color Squire HIll Buff and an accent wall near the opening of Baked Pretzel. Thanks for your help! Peter, thanks for the reply. Appreciate it. Not sure if you realized it but the picture above of the kitchen cabinets is not my kitchen. I was at work the day I posted my question and I only had access to pictures of my kitchen floor. I want to be sure you still agree that The Giallo's or Santa Cecilias would warm up my room, so I am posting up photos of MY own kitchen today since I am able to do so at this moment. Sorry for the confusion. Also, can you give me an idea as what color to paint my kitchen? Over the weekend I had a party and I was told burgundy...but I just can't see burgundy in my kitchen. Not sure if it would definitely go with everything being a wall will be made into a half wall and looking into the color Squire HIll Buff and an accent wall near the opening of Baked Pretzel. Also, my kitchen isn't huge but it's definitely not a galley kitchen and it gets a lot of natural light so it's very bright. Thanks for your help! Below are pictures of my own kitchen (2 of them); the 3rd picture is showing where the wall will be opened and you can see the accent wall in my dining room (which is the darker wall) and the last picture is looking from the darker wall into my dining room which once that wall is opened, it will be right near the dining room table and looking into that room and the accent wall. The granite countertop would be right in between those areas. My kitchen is actually a very bright kitchen b/c the previous owners installed a mirrored skylight and it's huge. Again, thanks for your help. I took a look at your paint colors and it looks like you are right on track, go with your gut! The tones you picked out will definitely complement the granites you've selected nicely. Hey Trisha, I replied below, to Guest User, guessing that was you, thanks for the photos by the way. Hi Kathy, I would recommend a glass mossaic backspash with some white, beige, and blue tones in it paired up with white cabinets with a mocha glaze. Hi Kathy, I also agree with Peter regarding to the white cabinets. Light stone against white cabinets will creat you an elegant, clean and crisp kitchen design, which is popular right now. I have a great glass backsplash suggestion in-mind for this countertop choice. It's called Mirabelle Collection smoky brown glass tile in a brick pattern. I've attached a photo for your reference. Good luck! Peter and Adrian, Thank you so much for your suggestions. Right now we have painted parts of the cabinets 3 different colors and living with it for a few days to decide on the best shade to tie in the wall color with the granite. I am a big fan of glass mossaic backsplash so will be going out to pick out some samples. Thanks again! Mish, if you can, please upload some pictures. We are building a new home (first time builders) - kitchen is u-shaped 16'x15-1/2' with a 4x8 island. We selected 5" tigerwood hardwood floors and will be staining our new cabinets - thinking the island will be a dark stain (black or espresso) and the outer rim of cabinets we are still trying to determine a stain color. The granite color has stumped us. We like some with movement (netuno bordeaux and monte cristo) but don't know if it will be too busy with the tigerwood floor. The kitchen is open to the breakfast nook and greatroom - both will also have the tigerwood floors. Any suggestions on granite or cabinet color? We are building our cabinets ourselves and can do any custom stain we want - they are solid maple cabinets. Thank you! Hello! We are remodeling Our kitchen and can't decide on the color of countertops. We have a gray/brown tile floor and hickory cabinets with biscuit colored appliance s. The walls are a light yellow in color. We were leaning to a green color, possibly Verde Laura. Any suggestions? Hey! We are installing new cabinets, cream with chocolate glaze. I am having a hard time picking out my granite color because the rest of my kitchen is cool colors.My walls are a pale celery color. I am leaning towards moonlight. any thoughts? I have a dark grey marble tile coffee table that got damaged due to nail polsh remover spilling onto the table. It is clear that the sealant was eaten away. There is also a cup ring where on the table because of the nail polish remover. What can I do to remedy the table...what is the best items to utilize?